Last Saturday Bo and his son, Trent, decided to take a float trip on the Norfork River. 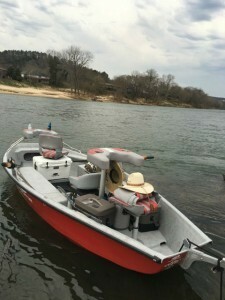 We hitched up Trent’s Predator skiff and made the hour and a half drive north to the Norfork River. Generation stopped about eleven o’clock and after arranging a shuttle with Dominic at Two Rivers Fly Shop we launched about noon. This turned into a really tough float trip. The wind roared straight up river at about twenty miles per hour almost all afternoon. Not only did you have to push hard on the oars the wind was actually blowing water and fly lines upstream! It was almost impossible to get the fly to drift so you were just not covering any water. All you could do was pick a likely spot near structure or a moss bed and hope you were dropping the fly right on top of a fish. We stopped a few times and wade fished some of the really good seams and caught nice fish at each stop. Trent caught a really nice Cutthroat pictured above and Bo landed a beautiful 14″ Bonneville Cutthroat which we did not get on camera. Really nice to catch one the Bonneville’s as it appears that the egg planting the past several years is beginning to show success. 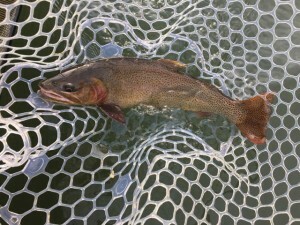 Finally about 4:30PM the wind let up and we got a nice midge hatch to finish out the day in a little more relaxed mode. Certainly not all was lost as we had a great dinner at Tommy’s Famous Pizza in Mountain View on the way home.